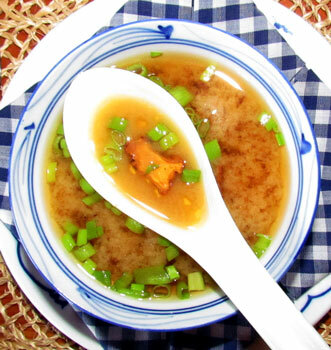 Simply put, miso is nothing more than a Japanese paste made from cooked, fermented soybeans. Simply put, this month's recipe is nothing more than a cup of miso soup...but, we think you'll find it to be an elegant preparation for the first white chanterelle of the season. Yes, there are chanterelles popping up from the forest floor on the southern Oregon coast! We presented our first find floating in a refreshing bowl of miso soup and followed it with a light salad featuring miso salad dressing for a refreshing summer lunch.